A very snowy week is coming to an end, leaving wonderful winter scenes in its wake. With so much closed due to snow, there’s been time to experiment with night scenes in watercolor and to give “hot press” watercolor paper a whirl. It took a couple of tries to start to get the hang of the paper, with its smooth surface, but it’s fun. When Bill Gates says, as he did recently, that we must “drive innovation at an unnaturally high pace” to transition to a globally-applicable non-carbon source of energy in time (to save the planet), it raises the question (or ought to) of what’s involved in doing that? If creativity is the “fuel” of innovation, how does one go about gaining and sustaining that fuel source? Do we wait, in a comfortable sunny spot, for inspiration to hit us? Sometimes we think of creativity as something that occurs to us when we are relaxed, doing something routine like driving through a toll booth or even–or most likely–when we are doing nothing at all… Is that what we must accelerate? Or are there more reliable means of spurring and sustaining innovation (and creativity) ? There have been a number of books on this subject, including on the need for “entrepreneurial states,” but in fact there’s been little noticeable tie-in of this material to the renewable energy challenge Gates and others are highlighting. With nearly all the people in this area still inside their houses after the snowstorm of the past 36 hours, a cardinal took a peek into the window today. Sunlight lit up the scene outside, creating dramatic shadow shapes on the snow, a real challenge to paint. After a while, it was time to take a walk outside in this wonderland, following a small path stamped down by others who passed this way earlier. Next on this blog, a look at why about one inch of snow that fell last Wednesday caused relatively more havoc in this area of about six million people than nearly 30 inches that fell yesterday. It turns out that, like snow blindness, “paradigm blindness” can affect our ability to see, and prepare for, what’s right in front of us. This is related to material we will commence teaching in the university semester which begins this week, so it is good for me to review it. A light snowfall caused havoc in the Washington, D.C. area last night as, unexpectedly, treacherous sheets of ice quickly formed and clung to roads everywhere. Major interstates were clogged or even shut down. No one was prepared for this. Despite the ordeal the wintry scenes made the ordinary appear quite extraordinary–such as this bank on a corner in Georgetown. The sketch was done from a reference photo which was taken while in the probably historic traffic jam of 20 January. By 3 a.m. the next day, the journey which started at 9:30 p.m. was safely over, thank goodness. A recent two-day artists’ workshop in “wax-resist techniques” provided loads of food for thought not just about this artistic process but also about the importance of thinking ahead to what you are trying to achieve…and how to get there. As a newcomer to the wax resist technique, however, I found myself falling back onto old habits and ways of thinking. Without a doubt, these were blocking my ability to internalize and apply these new approaches. The wax resist approach, like any other truly artistic approach, benefits from taking a great deal of time studying the subject first. “This process insists that you have a goal or else you get into trouble,” warned the instructor. “The wax is not forgiving,” he said. “Everything you don’t plan” comes back to bite you. The process involves repeated washes, first with plain water, and then ink washes, and a lot of intervals of drying the paper. What is difficult to realize ahead of time is the repeated and gradual nature of the process of building up the darks and the clever use (not over-use as in the example here) of the wax. This is not about painting or “rendering”, but it takes a while for the novice wax resist-user to grasp this. Now that class is out, there’s so much to practice. Fortunately, the necessary supplies are readily available–such as Gulf Wax which can generally be found in a grocery store. It’s the thought process that is more difficult to acquire. It takes time and guidance, persistence, and, for the best results as demonstrated by our instructor, clearly some enormous talent that few of us can assume. This workshop was an extraordinary learning experience relevant to much more than art. It underscored the huge gaps in our thinking processes when it comes to learning how to re-perceive what is right in front of us. Such ability to reframe the obvious in new lights (and darks) is key to achieving anything artistic, let alone the sort of breakthrough innovations we increasingly acknowledge are needed for (nothing less than) the future of the planet. Strategic and design thinking come together in use of wax resist in this process, as well probably in other applications, such as watercolor painting. For goals of still larger scale, such as enabling a global transition to a low-carbon economy, how to create environments that can accelerate our ability to grasp these ways of thinking will be the subject of future posts. The experienced artist who also is an effective teacher has a crucial role to play in the transition to the needed new thinking. While at a dinner party over the holidays, the gentleman next to me, who was originally from the Netherlands, told me that the illustrations of Anton Pieck, a Dutch artist (1895-1987), had made a big impression on him as a boy growing up in Holland. Pieck’s illustrations were in his childhood books, he said, and everyone knew about his work then. Pieck was an urban sketcher before people used the term, said the dinner guest. When I later looked up the work of Anton Pieck, what I found was something fantastic, inspiring, and somewhat familiar–surely I have seen some of these illustrations before. But what a “Master” to inspire the urban sketchers of today! 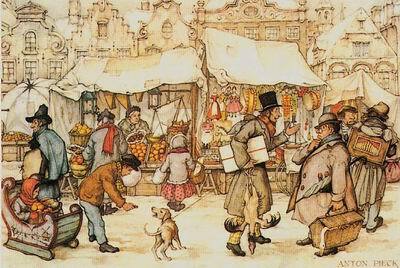 There is enormous detail in the work of Anton Pieck, sensitivity, and cheerfulness. In his illustrations, he recreates the feeling of the towns and cities of Holland in the 19th century and still keeps a fairytale atmosphere throughout his work. Pouring through his drawings, you will find whimsical details on both the architecture and in the market baskets people carry with them shopping. No subject escapes his notice, it seems. In the 1950s, after spending much of his professional life so far teaching and illustrating, Pieck was asked to help design a new theme park in the Netherlands called “Efteling.” This became his focus for the next 22 years. Throughout this time, he was responsible for almost all the fairytale aspects of the park, which is still popular today but I’ve not heard of it before now. There is much to learn from in the work of Anton Pieck, of course, and to immerse oneself in some fairytale worlds is tempting, (especially given the deeply disturbing nature what passes for news in the news these days). So, while immobilized by some sort of bug going around, I opened my sketchbook to do these practice pieces of excerpts of Pieck’s work. It surely would be like a fairytale to be able to adopt some of his style to sketch the modern street scenes of today–perhaps a “stretch goal” to work towards in 2016!